Get The Best Cellular Service Nationwide! These cellular coverage maps provide high-level estimates of our wireless coverage. Cellular coverage is not available everywhere and varies based on a number of factors. Our goal is to offer our customers the most accurate cellphone coverage maps. 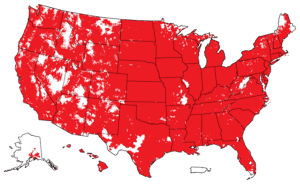 Best Cellular offers service on every tower from the largest major carrier in the United States, which means we give customers the best coverage in their area, without being biased towards one network over the others. We show you all the options and let you choose. What Is The Best Cellular Service In My Area? 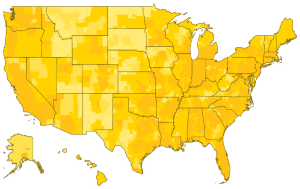 Use our free Best Cellular Coverage Map tool to check which carrier offers the best wireless coverage whether you are in your hometown, at work, or anywhere you travel. In addition, these best wireless coverage maps show wireless signal strength from every major network worldwide! Our network has access to every tower from every major network in the USA. We use this tool to show our customers exactly which network works best in their area. Once you determine the best coverage, activate your phone online! View and compare wireless coverage maps on different carriers before you choose a network. There are multiple benefits to using crowd-sourced cellular coverage maps. First off, real users build these live coverage maps. What is the difference? Simply put, a cellular company creates their own coverage map in order to sell you on their service. The accuracy of these maps can be flawed and the coverage exaggerated. Unbiased coverage maps provide consumers a true look at coverage of a given network. OpenSignal is a third-party company specializing in coverage maps. Their goal is to provide the most accurate coverage maps, not to sell you a service. In addition, real-time updates give these live maps an advantage over a printed carrier map or an image on their website. Networks typically run a signal analysis only a few times a year. This means that the reported coverage could be out of date. With crowd-sourced maps, users are constantly sending updates on real-time coverage. You can download the OpenSignal app yourself. Use your iPhone or Android phone to help expand the crowd-sourced coverage maps. Together we can help build a better coverage map for everyone! Get the best cellular coverage with a month to month plan. Choose what plan you want! Add more or even drop off excess to save more money. Through our connections with major US networks, you can choose what will work best near you. Best Cellular offers the best prepaid wireless plans for almost everyone! We take care of you with the Best Cell Phone Coverage. The Best Cellular Service covers most of America. You can keep Best Cellular coverage whether you’re traveling across states or moving to a new town. Your whole family can be on the same Best Cellular service and be miles apart. Keep that close connection while communicating as often as you like. Instead of exaggerating coverage to make a sale, our goal is to keep you informed. See for yourself who has the best service, using REAL signal readings from ALL Cellular carriers in your area. You can decide what service is best!